My local LGS, Mind Games in Metrotown, held a Chaos! 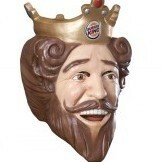 Draft on Sunday, February 4th. I have done Chaos drafts only a few times in my life, and rarely for 1-on-1 battles. 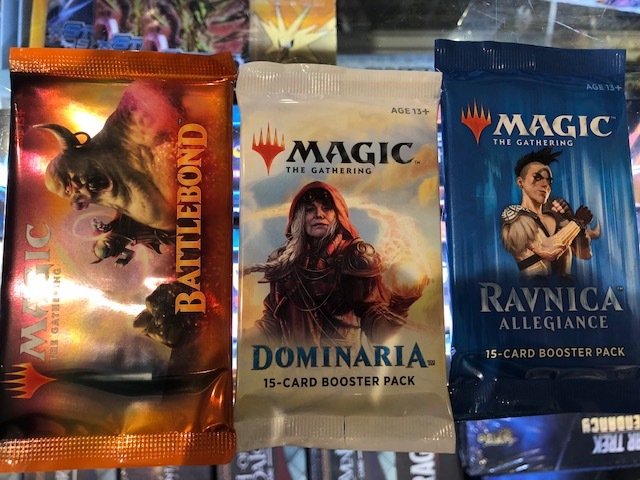 I picked my packs first, and went with Battlebond for funsies, Dominaria, and then Ravnica Allegiance. The store decided to not include any Masters sets...and has really only newer/Standard sets, so no Lorwyn or anything like that. I was pleasantly surprised to see a lot of the others players take 1 or more Conspiracy (Take the Crown) packs, which made the chaos draft even more fun. There were a lot of crowns being taken back and forth each game. I opened up Battlebond first, and took Noosegraf Mob. It’s an army in a can! My second pick was a Plated Crusher, and then I figured a ramp strategy would be viable. It was apparent, early on, that green was pretty open for me, and I was getting solid black cards. 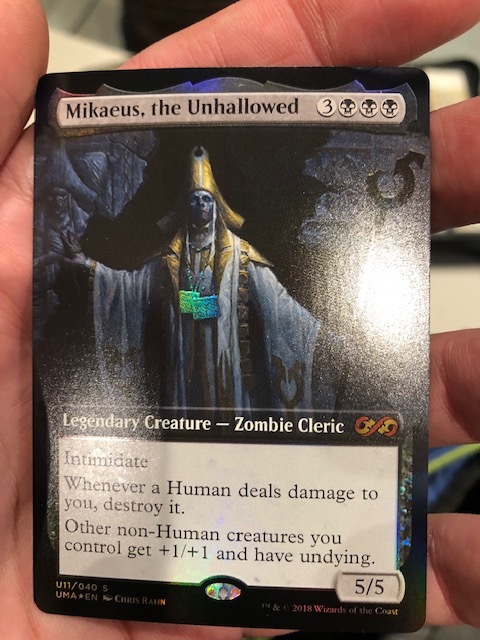 The second pack was Dominaria. The rare was Cabal Stronghold (bleh), so I had a choice between Slimefoot and Settle the Score. I really needed removal, so I took the Settle and prayed nobody else was GB and I could wheel Slimefoot. Luckily, I did wheel Mr. Slimey! 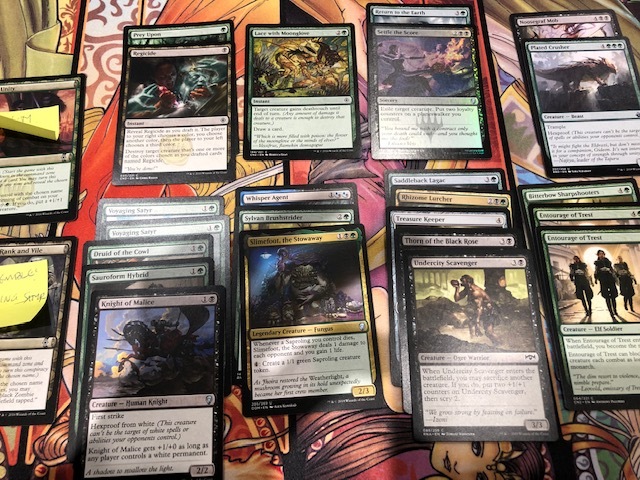 I was able to pick up two conspiracies (which help when you have multiples), one that allowed me to make zombies with the Satyr Wayfinders died, and one to give +1/+1 counters to the Entourage of Trests. The third pack was more of the same, with a few small additions to the curve and some sideboard cards. I picked Hallowed Fountain more for the $, and just had a few additions. I did find that I wasn’t getting any more removal, which was a bit concerning. After the draft, I could see why… 5 players in total had black cards in their deck. It was obvious that the packs were deep in black, and each deck splashing had a good # of playables. It also meant I was being cut off from the removal. I know I was passing a lot of good red, and the two players on my left picked red-blue and red-black-green. At least they got those signals. ROUND 1 – I played against that red-green-black player. His deck had a LOT of removal, plus the limited bomb Avatar of Woe. Woe was me, alright. I won game 1 thanks to Noosegraf Mob. Game 2 was tight, but he had resolved Avatar of Woe and I didn’t draw removal for it. Game 3 wasn’t close as I started with 4 lands and drew nothing but lands. His deck was very good, so I needed to draw perfect and I didn’t. He ended up 2-1 and lost in the finals to a UW Control build. ROUND 2 – I played against the UR player I had passed to. He had a lot of tricks, Charmbreaker Devils to get them back, and counterspells. Game 3 was another Noosegraf Mob win, as I had the army out to go wide, plus Plated Crusher to ram through. An FLUNGE! for exactly 12 was the deciding factor. This was his first chaos draft, so he wasn’t sure how he did. I think he drafted a pretty decent deck for his first time. ROUND 3 – He had the Conspiracy that made his creatures deal damage equal to their toughness, which turned his 0/4s into essentially 4/4s. Ouch. This was another tight match, with me winning in 3. Game 1, I had Slimefoot making 2 saprolings a turn, and basically pinging him to death with value. Game 2, he had the Hexproof ‘3/2’ flyer and the 1/3 flyer dealing 3 damage to me each turn. I could not deal with the hexproof guy AT ALL. Game 3, he didn’t get blue mana, which helped me get a good start. His deck was good, and on theme, but his mana base was a bit tough on him. The draft didn’t seem to have much mana fixing. So, a 2-1 record with 3 tough matches. I am fairly happy with how I drafted, and was able to jump on the right colours early, especially green. I just wish I had a bit more removal to go along with the beef I ramped into. Monarch, especially, helped grind out some longer games.